Auto-mobile accidents have been increasing in the past years. While most crashes produced injuries that are not so severe, some car crashes have victims that are in potentially life threatening situations. Knowledge and skills in basic first aid and cardiopulmonary resuscitation is a great asset when helping victims against potential life threatening conditions. The following are some helpful guidelines in the immediate rescue of victims of a car accident. It is important to note that If you witness an accident, send a bystander to call 911 immediately. Do not assume that someone else made the call. Ask the bystander to report back to you once they have made the call. The material posted on this blog post on rescuing crash victims is for learning purposes only. To learn to recognize and manage serious injuries and broken bones register for a course with one of our first aid and CPR providers. Should you need to approach the scene, keep in mind to ensure your own safety first. Before approaching the area, survey the scene for any hazards such as downed power lines and gasoline spills. If there is no impending danger under the circumstances and it is safe to approach the car, do it slowly and with caution. Check for any victims inside the car and around the vicinity as the passenger or the driver may have been thrown out after the car accident. Do not move the victim unless there is an imminent danger, such as a car fire or oil spills. The possibility that the victim of the car accident may have sustained a neck or spinal injury or broken bones should be considered. Allow the medical responders to remove the victim from the scene, but make sure to stay around and assure the victim that help is coming. 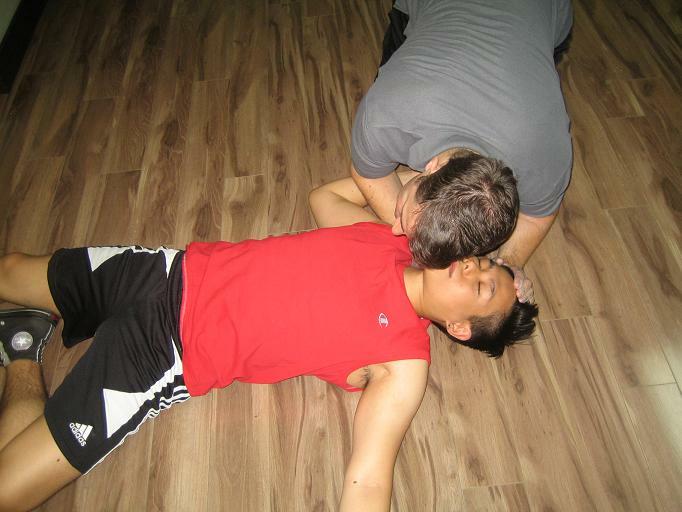 Check the victim’s airway and breathing pattern. Never tilt the head in an attempt to clear the airway. Hold the victim’s jaw and move it forward (jaw thrust). When necessary and if you are trained in basic emergency skills, perform CPR. If you insist on helping without the necessary training, you may endanger the life of the victim and makes the condition worse. If you notice bleeding, safely apply pressure to the injured site using any clean cloth or any available pad to allow the blood to clot. If the blood soaks through, add another absorbent pad. If there is no evidence of a fracture, raise the injured site above the heart level. This will prevent the victim in developing into shock which can be a life threatening condition. The symptoms of shock include pale, moist, clammy cool skin. Weak, rapid pulse, dilated pupils, weakness, thirst, nausea and vomiting and shallow breathing are also signs of shock. When the person is under this condition, have him lie down on his back. Keep the victim warm and provide reassurance. Jharkhand police. Helping Road Accident Victims. Retrieved on June 23, 2014 from http://www.jhpolice.gov.in/road-safety/helping-road-accident-victims.